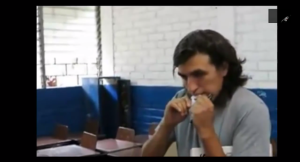 Víctor “Crack” Rodríguez is facing up to six years in prison for a performance piece. After the general election in El Salvador that split the winning left party from the right by a margin of less than 1% percent, tensions in the country are high, especially amongst the nation’s community of artists, who are rallying to defend Rodríguez, one of San Salvador’s celebrated contemporary artists. On March 9th, 2014 Rodriguez walked in to a ballot station and announced, “this is an artist action,” then proceeded to eat half of his ballot in front of polling station onlookers before casting the remaining half. A video of the artist’s performance went viral. But the situation quickly turned ugly as the Salvadoran legal system reacted, accusing the artist of electoral fraud — a criminal offence punishable by up to six years in prison. The fact that many of us feel there is not one political party or candidate in which we can believe or respect yet having the authorities tell us that the vote is “the people’s most powerful weapon,” makes many of us identify with his action. According to the law, “Crack” could be facing from 2 to 6 years in prison for expressing himself in this way, how senseless! We won’t allow it. I think the action is one of the most important, consequent and effective works of contemporary art in Central America’s history, no doubt. The artists’s collaborators Ernesto Bautista, Mauricio Kabistan, and Melissa Guevara, fellow members of the collective The Fire Theory, have created a petition in order for the art community at large to show their appreciation for the artist’s intention. The artists are hoping to use this petition as evidence to show that Rodríguez is a seasoned artist and that this “call to action” forms part of his practice and is not a crime.